When sharply divergent cultures meet at a crossroads these days, we tend to brace ourselves for the sickening sound of collision. What else have the headlines from Bosnia and Rwanda, Ireland and Israel taught us? Yet here's a picture we don't see very often: eight Christian girls from Paris, ten Israeli boys, and a mixed group of twenty Muslim adolescents all sharing the same concert stage armed only with sheet music and fresh young faces ready to make a joyful noise. It was opening night at the third annual Festival of World Sacred Music in Fez, and the Chorus of the Children of Abraham were kicking off the week-long celebration with a command performance attended by the Crown Prince of Morocco. The setting for the concert was nothing less than spectacular. 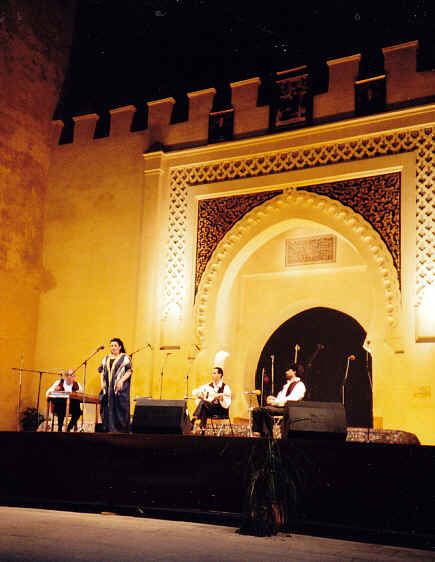 The stage spanned one end of a stunning courtyard of the king's palace, constructed in 1308, surrounded by 50-foot crenellated walls and classic Arabic keyhole arches, bathed in buttery light under a cloudless night sky. Of course, the symbolism of assembling an interfaith youth choir to represent a hope for world peace was corny as all get out: yeah, yeah, "We Are the World" already. Even so, such idealism is always touching, and the image served as a potent reminder of music's power to transform discord into harmony. For young people, world music has become increasingly instrumental as a way of communicating across cultural gaps. Especially in the last ten years, with pop superstars like Paul Simon, Sting, and Peter Gabriel serving as cultural ambassadors, English-speaking fans have been introduced to previously underexposed musical traditions from Africa, Brazil, and Pakistan. Record stores now routinely stock discs from all over the globe. One branch of world music veers toward cross-fertilization: African musicians mixing tribal rhythms with synthesizers to create international disco hits in a Belgian recording studio. The other branch sticks close to traditional roots in folk or sacred music, leading to the surprise popularity of Sufi singer Nusrat Fateh Ali Khan and Gregorian chant sung by Benedictine monks from the Spanish monastery of Santo Domingo de Silos. It's not accidental that an international festival devoted to sacred music should emerge in Morocco. The country prides itself on being what the French call a carrefour, a cultural crossroads. The indigenous Berber population of North Africa has historically welcomed refugees from religious persecution. The first wave of Jewish settlers arrived in 500 BC. Moulay Idriss, a descendant of Mohammed, established the western front of Islam in Morocco in 770. And in 1492, after King Ferdinand expelled the Jews and Muslims from Spain, many resettled in Morocco. Primarily Muslim today, the country retains traces of its Berber ancestry, its Jewish heritage, and the influence of its 20th century history as a French colony. The city of Fez in particular clings to its identity as an intellectual, artistic, and spiritual center where -- in contrast to other Middle Eastern locations -- Christian, Jewish, and Muslim cultures have peaceably coexisted for centuries. 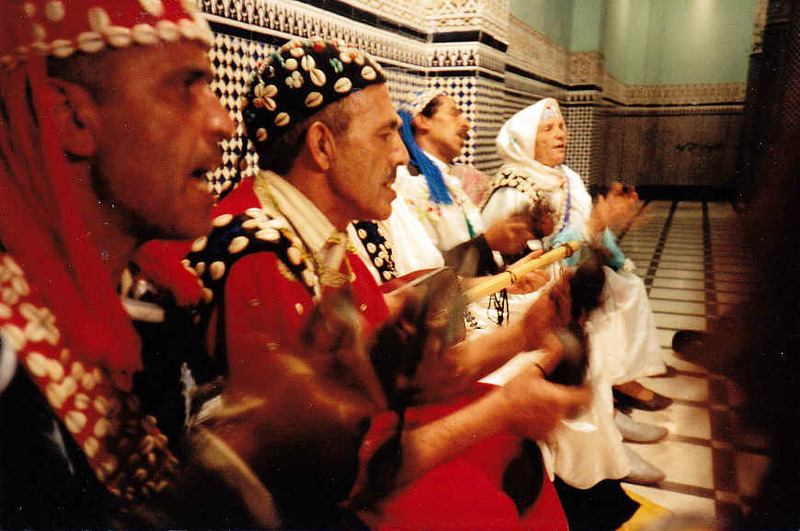 In 1993, the Fez-born anthropologist Faouzi Skali obtained the support of King Hassan II and his minister of finance for a music festival that would provide a symbolic meeting ground for various religious traditions. (Well, monotheistic religions anyway. No Hawaiians, Javanese, or Celtic pagans need apply.) To organize the artistic program, Dr. Skali hired Gerard Kurdjian, an amiable Frenchman who had been directing world music festivals in the vicinity of his hometown, Nice. I traveled to Fez with a tour group from the World Music Institute, which sponsors a subscription series of concerts by international performers in New York each year. Attending concerts by artists such as Nusrat Fateh Ali Kahn and the Whirling Dervishes of Mevlevi has whetted our appetites for a whole week of world sacred music. Although the bill of fare promised an American gospel choir and Bach cantatas performed by a Swiss chamber ensemble, I was personally more hungry for non-Western sacred music, especially the kind of ecstatic singing that pushes the human voice to the farthest edges of emotional expressiveness. In fact, part of what convinced me to spring for the trip was hearing a CD made at last year's festival called B'ismillah (Sounds True Records), which featured delicious selections of Christian flamenco, Egyptian chanting, and Berber trance music -- my kind of passionate vocalizing. Sure enough, there was some wild devotional praise-singing on display in Fez. A raven-haired diva named Aicha Redouane (above), for instance, made the stones of the palace courtyard ring with her rendition of Egyptian classical vocals. Singing 27-note phrases with her mouth closed, she inspired grown men to leap to their feet shouting "Allah!" Unlike last year, though, this year's Festival of World Sacred Music focused less on exuberant displays of devotion and more on contained expressions of spiritual ecstasy or, to use Mr. Kurdjian's word, "interiority." No performer more perfectly exemplified the quality of interiority than Sister Marie Keyrouz. A Lebanese Maronite nun with a doctorate in musicology from the Sorbonne who sings Byzantine Christian liturgy in Arabic, she appeared onstage in a traditional black nun's habit and what looked like a constant state of prayer. She sang quietly and delicately with her eyes closed, fists propped under her chin or against her heart. Spinning out long lines in a wobbly vibrato that proved to be precisely controlled modal singing, she sounded like an eerie combination of opera diva Maria Callas, the legendary Egyptian singer Oum Kalsoum, and a ghostly night wind. Her six musicians and seven-piece choir emitted the faintest of drones, providing a hushed cloud of sonic padding for her singing. This was music so inward-focused as to be practically hallucinatory. As the week went by, it became clear that the festival embraced a definition of sacred music that went way beyond the liturgical to include any music that has been treasured, valued, and preserved for a very long time. The Sephardic tunes performed by French-born chanteuse Francoise Atlan, while they were gorgeous, have little to do with Jewish religious practice. 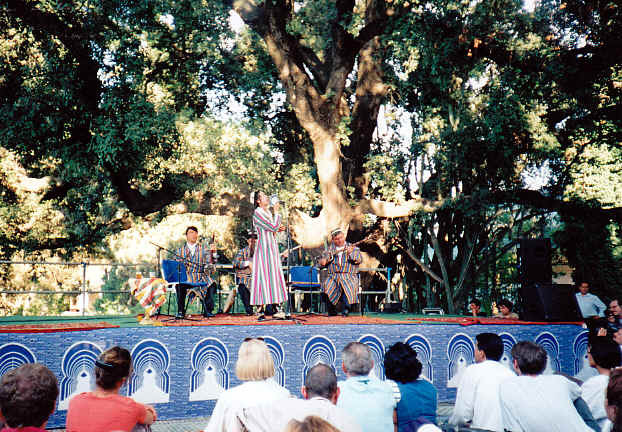 Monajat Yulcheva's recital of village music from Uzbekistan (see below) represented a corner of Islamic culture not often heard from, though it wasn't strictly church music. 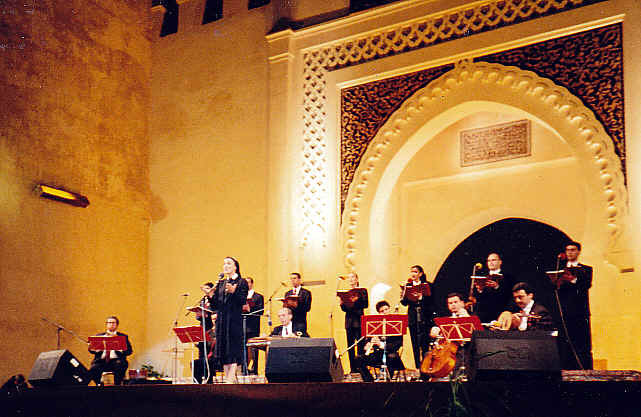 And whatever the spiritual origins of the Arab-Andalusian melodies played in unison by the 51-piece Ensemble Al Brihi from Fez, the hometown audience received it as all-purpose good-time music, clapping along as enthusiastically as they did with the doo-wop gospel offered by the A.R.C. Choir from Harlem on the closing night of the festival. At both the evening concerts and the afternoon shows held in the more intimate courtyard of the Batha Museum, the smattering of American and European tourists were in the distinct minority. We rubbed shoulders with the upper crust of Fez society, who all seemed to speak French, wear Armani, and clutch cellular phones. For us Americans, the price of the ticket packet -- 1500 dirham (about $175) for 12 concerts -- was a steal, the equivalent of one night out at the Metropolitan Opera or a Broadway show. For the average Moroccan, though, it was a month's salary. To encounter more typical Moroccan existence, we spent our days wandering through the medina. Every major city in Morocco has an ancient walled city, built by Arab settlers to protect themselves from the harsh landscape. Fez's medina, which dates to the ninth century, is the largest and most famous. More than a quarter of a million people live in this dense pueblo-like structure, sharing communal baths and bread ovens. They worship at more than 360 mosques, which dazzle the eye with geometric designs in tile, plaster, and woodwork. In the souks that line the thoroughfares, artisans hand-make and sell the goods Morocco is famous for: carpets, pottery, fabric, leather goods, carved bronze and the like. The medina is closed to motor vehicles; the sight of donkeys hauling heavy loads up and down the steep and narrow flagstone streets can leave visitors with the dizzying sense of having hurtled back in time a century or two. Because the leader of our tour group was Moroccan, we were privy to a few experiences ordinary travellers might miss. One afternoon we took the bus to Sidi Ahmed Bernoussi, a small town in the mountains, where we were met by a small band of musicians playing drums and raitas, those snake-charmer horns whose piercing blasts are like wasabi for the ears. The band led us in a procession up the hill to the shrine of the town's namesake, where we were treated to a zikr -- a call-and-response prayer ceremony sung by the male elders of the community -- followed by a sumptuous couscous lunch served on blood-red kilims spread on a hillside with a splendid view of the verdant valley. Another night, after the evening concert, we partied 'til the wee hours at a private home in the medina, where the women in our group had their hands and feet decorated with henna -- as Moroccan women do for weddings and other celebrations -- while a band of Gnawa musicians (see below) performed a hypnotic ritual of dance and song. These informal social interactions reminded me of something that it's easy to forget while watching formal sit-down concerts at the festival. In much of the world, music is not just entertainment but a form of spiritual practice intimately intertwined with the mundane activities of everyday life. So to share such a musical experience in person is a sweet and soulful act of communion, way different from plunking down your credit card to buy a CD at Tower Records. 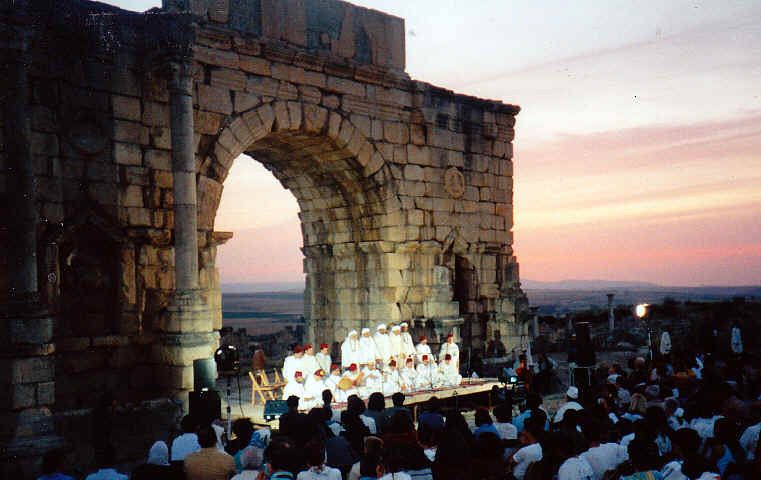 To make sure that every festivalgoer had the opportunity to get a change of scenery, the organizers scheduled one afternoon concert at Volubilis, a Roman ruin an hour outside of Fez. Underneath a massive stone archway against an increasingly lurid purple sunset, three generations of musicians from traditional Fez families performed Sufi chants for an audience whose demeanor -- casual reverence? reverent casualness? -- bespoke a culture where the music that's sacred isn't the opposite of popular. "What the public senses even if they don't know it consciously is that there's a deep link between traditional music and sacred music," Gerard Kurdjian told me, leaning on a crumbled wall some Italian built millennia ago. "They invoke a nostalgia that's not personal but archetypal. It's the nostalgia of anyone on earth trying to get in touch with transcendence or eternity." His point was well-made in an afternoon concert of Indian music in the courtyard of the Batha Museum. The headliner was Ustad Zia Fariduddin Dagar, in whose chanting could be heard echoes of jazz improvsation and rap rhythms. I was more struck, though, by his nephew Bahauddin, who opened the show playing a raga on a eight-stringed Rudra veena that belonged to his grandfather. The sight of this young man handling a magnificently carved instrument more than a century old, in the shade of a giant barbary oak tree full of singing swallows under a clear blue sky was as memorable an image of eternity as the festival in Fez had to offer.